Clarksville, TN – Austin Peay State University’s football team completed its second intrasquad scrimmage, Saturday afternoon at Fortera Stadium. 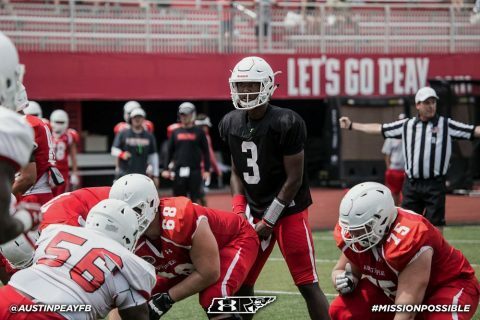 The Governors offense controlled the opening four drives with both quarterbacks – JaVaughn Craig and Jeremiah Oatsvall – leading their units to touchdowns in the first four drives of the scrimmage. Oatsvall led a six-play, 70-yard scoring drive while Craig marshalled his unit to a nine-play, 65-yard scoring drive. The next four drives saw the offenses each turn in another touchdown drive. Craig needing just four plays to find the end zone, capped by Kyran Moore‘s 57-yard run. Oatsvall responded by leading his unit on a seven-play, 60-yard scoring drive that he capped with an 11-yard pass to Daryl Rollins-Davis. The defense battled back in the scrimmage’s second half, notching two interceptions and two sacks while allowing only one touchdown drive – on a red-zone setup – in the final eight drives. Rodney Salusbury and Tyler Gardner each picked off passes, Salusbury’s coming in the end zone to thwart a scoring change. Austin Peay will hold its third and final scrimmage of the preseason next Saturday as part of Austin Peay Football’s Fan Fest.